When people ask for good digital nomad jobs in Facebook groups, one of the answers is always “teach ESL” (or another language). As someone who has been teaching online since 2012 and lived as a digital nomad since 2014, I’m getting tired of hearing this suggestion. Especially as the answer is normally accompanied by a referral link for a Chinese company. I don’t teach ESL, by the way, and would never ever work with children. But that’s a personal preference, of course. Ok, I don’t write this article with the intention to discourage anyone from teaching online. I just think it’s necessary to have a look at the negative and difficult sides, too. However, I’ll also give you tips on how to deal with difficult situations. That’s probably the worst part about it. You do not simply need internet, you need good and stable internet. That means that you cannot travel wherever you want or book any accommodation which looks nice in the pictures. 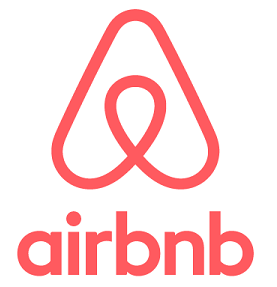 And you will be surprised how many Airbnb hosts have no idea how to run a speed test. I need to contact an average of 3 hosts before someone is able to give me the exact download and upload speed in the room or apartment they rent. 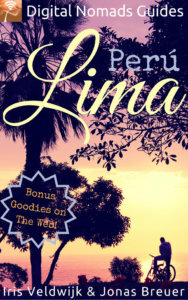 That’s one of the reasons why I’ve started to compile a list of digital nomad-friendly accommodation in Peru. If you’re hired by a company, they’ll often require that you don’t use wifi. Although they probably won’t check that regularly, it means that an ethernet cable should be part of your equipment. The internet speed may be good but not always stable. That’s pretty common in Latin America, suddenly the signal is gone. Sometimes just for a few seconds or minutes, sometimes for an hour or two. I use a GlocalMe device with a local SIM card for such emergencies. You may think that using a hotspot and teaching with mobile data is a great solution. Unfortunately, it’s often an expensive solution. Skype, for example, uses up a ridiculous amount of data. When both you and your student have good and speedy internet, you’ll be shocked to see when 1GB is gone after just one hour. So unless you travel in a country where data is extremely cheap, teaching with mobile data is just for emergencies. In the beginning, when you start teaching, you’ll be nervous, constantly checking your material. Everything will be new and exciting. However, after a while, it will be a routine. You’ll talk about the same topics over and over again, you’ll answer the same questions dozens of times, you’ll explain the same grammar to hundreds of students. Does it sound too negative? Well, your reasons why you want to become an online teacher are important. If the traveling and digital nomad lifestyle part are most important, you WILL suffer from a lack of creativity at one point. On the other hand, if you’re passionate about teaching others your native language, you’ll probably enjoy this kind of work for much longer than someone who just regards it as a way to make easy money. I know online teachers who create their own material and develop their own brand and love what they’re doing. However, that’s not what I see when people are asking about ways to finance their travels. So be prepared that it will become boring after a while, no matter how nice your students are. No matter whether you teach for a (Chinese) company, use a platform like italki or verbling or have your own brand, constantly changing time zones will give you a hard time when teaching online. When you teach for a company, your working hours will change whenever you travel to a new place. If you’re not an early riser, traveling in Latin America while working Beijing hours will be tough as you’ll need to get up at 4 am and often work another round in the evening. If you use a platform, you can set your own schedule but changing continents will result in losing students who suddenly can no longer book the times they were used to. Sure, new students will come but save it as a fact that you better shouldn’t change time zones too frequently as an online teacher. Well, long-distance flights are bad for the environment, anyway so staying on the same continent for quite a while is a great thing. Ok, that’s an issue for all freelancers and small company owners who exchange time for money. So why do I mention it here explicitly? Well, it’s connected with no. 1 on the list, the internet problem. As a content writer or social media manager, you can travel to places with bad internet and get some work done even if you might end up swearing constantly. As an online teacher, you’ll have to take time off or even cancel lessons. I’ll spend 9 nights at the Galapagos Islands in October and won’t teach at all. 9 nights are perfectly doable, everyone needs a vacation once in a while. However, if you take one month off, this won’t only mean no income but you are likely to lose students, too who looked for another teacher while you were having a great time in the jungle. I’m always surprised when people claim they make good money teaching online. Really? How do you define good money? For me, it means that I can live everywhere without having to rely on my savings. Well, I’ve yet to meet an online teacher who makes enough money to live comfortably in San Francisco, London or Sydney. I earn an average of USD 2,000 – 2,500/month, teaching 20 – 30 lessons weekly. That’s not totally bad but I wouldn’t call it a good income. It’s enough to live comfortably and save a little, no more and no less. It’s not where I’d still like to be in another 5 years. And it’s before taxes, of course. Teaching online is definitely not one of the well-paying jobs for a digital nomad and therefore another reason why you should aim for other sources of income. If you’re an extrovert who gets energized by talking to people, this doesn’t apply to you, of course. However, I’m an introvert on the very extreme side of the spectrum. I teach an average of 4 hours/day and a maximum of 6 hours/day. 99% of my students are very nice and often very interesting people. But teaching online means constant social interaction and constant concentration and that’s extremely energy-draining for introverts. So if you’re an introvert, please don’t feel bad if you just want to be alone after work. However, try to take a walk at least and maintain a tiny bit of social life. Why not start a blog as a side hustle? 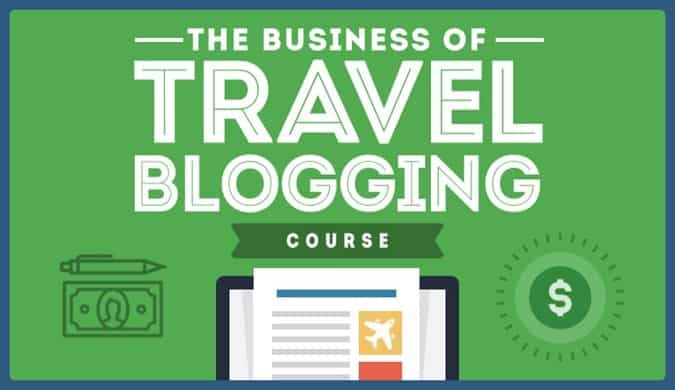 The Business of Travel Blogging Course by Nomadic Matt gives you all the information you need to rock your blog business from the very first day. Plus access to a great community of fellow bloggers. It helped me to earn my first dollars from blogging and even for online teachers, it’s affordable :-). 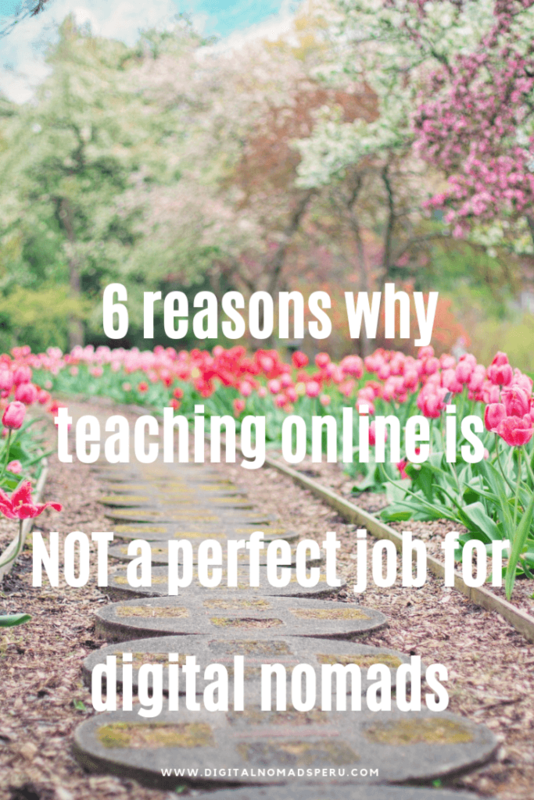 Still want to teach online? Ok, it seems I haven’t put you off yet. That’s fine. Teaching online enabled me to start out as a digital nomad and to meet some awesome people. That’s something I’ll be forever thankful for. If you want to connect with fellow teachers, join the Digital Nomads Teachers and Tutors group on Facebook. I’m still a member but not active anymore. Unless you’re really passionate about teaching and totally sure that it’s your dream job, set time aside to learn skills which will, later on, enable you to either stop teaching or reduce your hours to a minimum. Having various sources of income is never bad, by the way. I only started to teach less and focus on other streams of income a couple of months ago. Much too late. 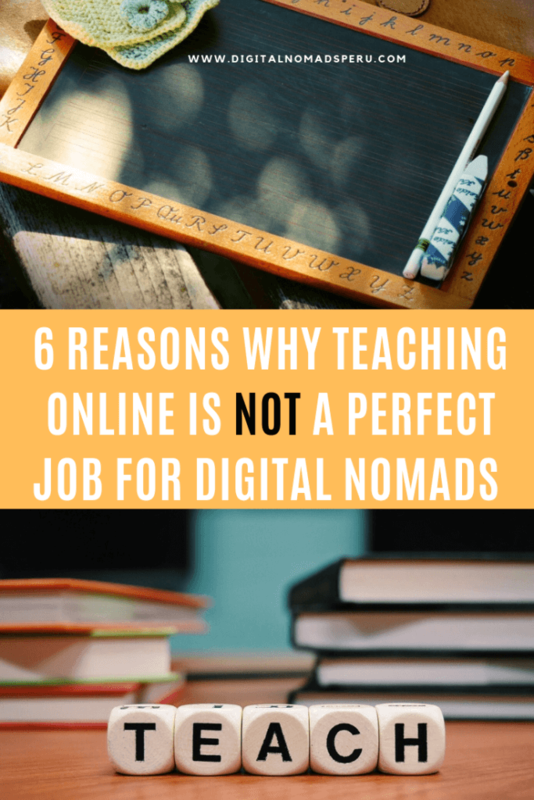 Teaching online is a great way to get started as a digital nomad but you should be aware of the restrictions that come with this job. That’s the reason why I wrote this article and I’d love to hear what you think. Write in the comments and share your opinion. Did you like the article? Then why not share it on Pinterest? Muchas gracias!